this ever so wonderful scarf arrived i my mailbox last week and isn't it WONDERFUL? i just died when i saw it i love, love, love it. 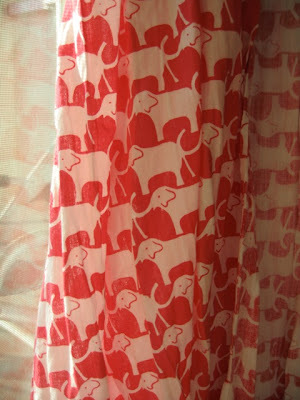 elephants? um yes. surprise gift? um yes. wow i am one lucky girl. oh and maybe the second best part of receiving this scarf ... the discovery of virginia johnson, her textile are fabulous. i love them all. i am even thinking of having my friend, the dress maker, make me a little something from pink hydrangea and grey racing (as in together on the same dress ... i might be crazy but it might be perfect). that is once i am back to buying clothing - i seem to be on a not exactly panned hiatus, which means there is all of a sudden a ton of stuff that i am just dying to have ... oh yeah and a trip to new york coming up in ONE DAY!!! ohhhh I love that print!! I'm from cali but im at school at alabama and of course our mascot is an elephant. and this is so cute! even our colors. love! ahh...jealous! I love virginia johnson and I love elephants! you are so lucky!